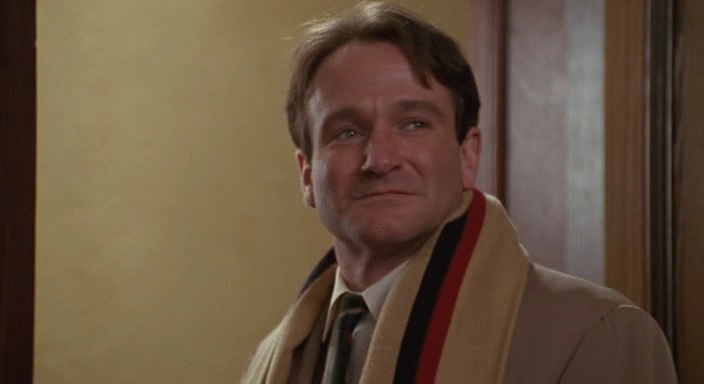 Robin Williams had one of those careers where you forget just how many momentous films he was in. Of course, there are always the immediate ones that come to mind, a list that I’m sure varies from person to person. For me, it’s Aladdin, Hook, and Good Will Hunting. But then I scroll through his IMDB filmography, and I’m suddenly going down memory lane as I remember and realize how much my childhood was influenced and filled by his talent, humor, and presence. From watching FernGully on repeat, to Mork and Mindy, to Jumanji scaring the bejesus out of me with those enormous plastic spiders, to the iconic Mrs. Doubtfire, Robin was a constant in my young life. And as I continue to sift through IMDB, I recall Dead Poets Society. Patch Adams. The Birdcage. Awakenings. One Hour Photo. And then there are the ones I have yet to see like What Dreams May Come, Toys, and Good Morning Vietnam (I know, I know. Maybe now I’ll finally get around to it). And that list doesn’t even touch half of the films he made – films which influenced audiences all around the world. I don’t know how many of you watched his recent CBS show, The Crazy Ones (obviously not that many being that it didn’t get picked up for a second season). Nonetheless, I watched all of it and believe it was canceled prematurely. It was quirky and weird and maybe a little too out there, but it was hilarious and knew exactly what it wanted to be. Kind of like Robin. I couldn’t fall asleep last night because I fell down the wormhole of watching clips and kept crying. As much as I’ve been saddened by some of the great actors we’ve lost in the last few years, this hits closer to home, as I imagine it might for many of the folks in my generation. We grew up with Mr. Williams. He shaped us. He taught us comedy, improvisation, voices, joy, and how to do an impression of a hot dog. After I saw the news last night, I called my mom and said that I can’t believe we’re getting to a point where the generation of actors I grew up watching is dying. But we shouldn’t be there yet. Robin, you left us too soon. We will miss you and will continue to watch your films for years to come. Whenever we’re looking to be uplifted. Whenever we want to be inspired. And most importantly, whenever we’re in need of a laugh. For me the best films were Dead Poets Society, Mrs. Doubtfire and The Birdcage. He was someone about whom the word ‘genius’ is accurate and yet insufficient. James Lipton says he was the true Pagliacci: the clown who wept.